That didn’t take long. 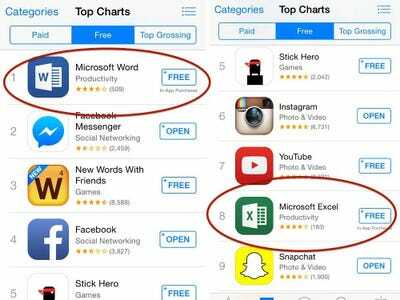 On Thursday Microsoft released free versions of its Office apps for iPhone users, and seriously beefed up Office for iPad. Four days later, Microsoft Word is No. 1 most popular app on the iOS App Store. Excel is No. 8 and PowerPoint is No. 10. That compares to Apple’s own competing Office apps: Pages at No. 16 (an alternative to Word), Numbers at No. 17 (an alternative to Excel) and Keynote at No. 18 (an alternative to PowerPoint). Microsoft’s new free iOS versions of Office do about 90% of what most people want to do with Office. Microsoft has restricted a few advanced features for the paid versions. Probably the biggest restriction is that you can’t edit documents sent to you from a business account. You can view documents sent to you from someone else’s business account, but not make changes. All-in-all, this early success shows that Microsoft’s latest strategy is working. Given a choice of free apps, looks like people will choose Microsoft Office. The next step, of course, is to entice people to pay for a full Office subscription. CEO Satya Nadella hopes to entice customers to buy those subscriptions by adding special productivity-enhancing features. Microsoft Office wants to do things that tell you the most important bits of info stored in your documents, like letting you type in questions and get charts and graphs as answers, or bundling in minutes on Skype, which will soon have a fancy new language translation service. But for now, Microsoft just wants to make sure that people keep using Office on their iPhones and iPads.